Pupy, cute the little puppy explores the world with his usual pranks. His curiosity to learn new things teaches him many new facts about the living beings and the social order around him. He is always doubtful and asks questions on each and everything he feels strange. In fact, his questions lead him to great answers that are scientific truths. The animation video intends to instil scientific temper in children. Pupy?s exploration of the world around him teaches that science is everywhere and around you. The animated doll Twinkle, who very much identifies herself with the children and their world, anchors the entire programme. 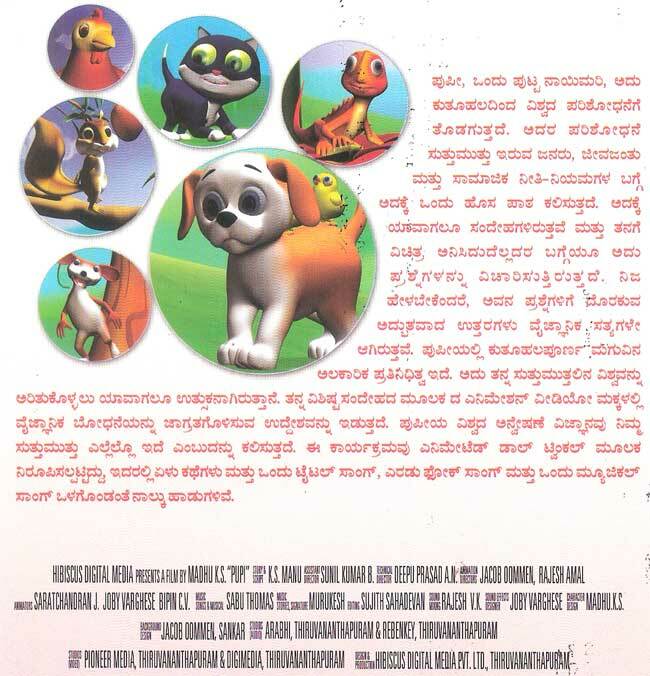 The Kannada animation video includes seven stories and four songs including a title song, two folk songs and a musical. Pupi won four awards in the All India Children's Festival 2007 * Best Program * Best Direction * Best Animation * Best Editing .Poopy is the fourth title in the Twinkle Twinkle educational content animation video series produced by Hibiscus Design.